Greetings friends and fellow crafters, LeeAnn here with my inspiration for the Mod Squad Challenge Blog. I used Memento Tuxedo Black to stamp my images on Recollections 110 lb card stock. I then used my Scan n Cut to cut out the images. Using my Spectrum Noir markers I colored the images. The bike was done using True Black, IG5 and IG6 on the motorcyle along with BT7. For the Bunny I went wtih BG2 and TB4 for the highlights. I also used Black and Silver Wink of Stella to highlight spots such as the glasses, tires and areas of the motorcycle. I used Lawn Fawn dies for the grass and road. 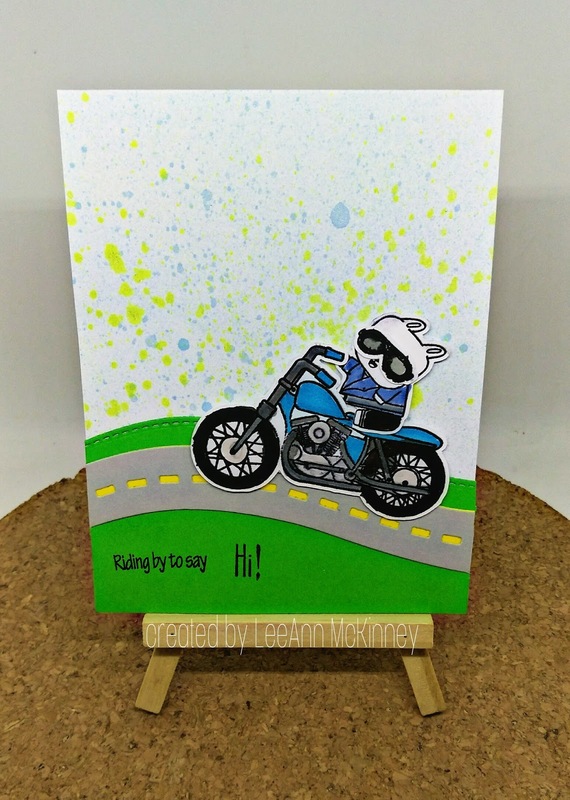 The background is done with Fireworks Summer Sky Shimmer Spray and Tattered Angels Lemon spray. I used double side tape for all layers except the motorcycle and bunny where I used foam tape for added dimension. The sentiment was stamped with Onyx Black Versafine.